Smart communities are already getting a comprehensive view of needs and resources by using GIS and even incorporating realtime sensor data and 3D visualization. Citizens and businesses are using open data and increased governmental transparency to collaborate and drive innovation. When you can see the entire, community-wide landscape, it is much easier to identify gaps in service or areas that need to become more livable, sustainable, and resilient. 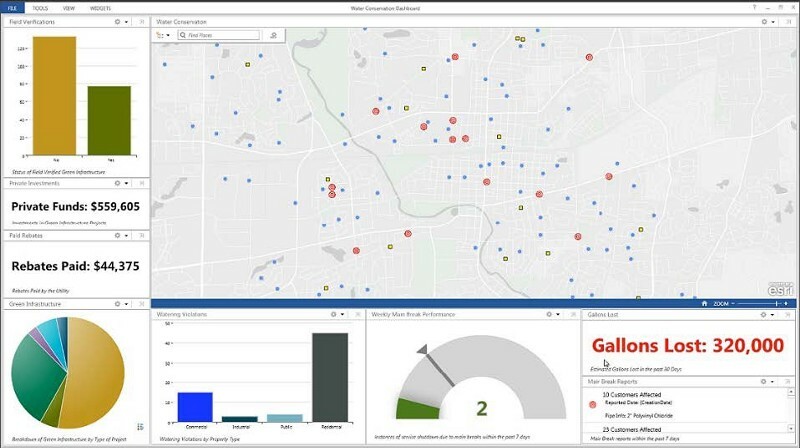 That clear view can be seen from a GIS platform — a way to view, map, share, analyze, and act on information about the community. GIS pulls it all together and provides a clear view. Every feature and resource in the community has a location. You can use that location within your GIS to look at data from various sources, systems, or departments. You can analyze community assets in relation to other assets or features of the community to gain valuable context and greater understanding. In this way, location is the common thread needed to create a complete view of what is happening. When you look at a map, you inherently start turning that map into information by finding patterns and assessing trends that otherwise would not have been uncovered. This is spatial analysis. When you see information about your community on a map, you understand where resources are located and where they will need to be in the future. Community leaders use maps to actually see where historic changes have occurred and how future plans will impact the community. This makes the decision-making process more focused, better researched, and more in line with smart community goals. A complete picture: In this dashboard view, GIS brings together multiple sources of information on a map for greater context and smarter decisions. Where is the best location for a new building or a community service offering? Is there a relationship between disease and environmental features in our community? What are the most efficient alternate routes a bridge is closed for repair? Where are water contaminants most likely to flow? Where will a fire most likely spread? By using spatial analysis to answer questions and make predictions you give your community smarter use of its resources plus better services and increased safety for its citizens. The possibilities for spatial analysis are practically endless, limited only by the imagination and available data. Fortunately, new sources of data continue to emerge. Communities have access to a new source of detailed, real-time spatial data, thanks to the expanding use of sensors for tracking, monitoring, and connecting many daily operations. Sensors can broadcast when a parking space is open, a city trash bin is getting full, or an energy turbine requires maintenance. When sensor data is combined with GIS, communities can see what is happening where and react more rapidly to events. Using GIS and sensor data, many communities are tracking the real-time location of snowplows, police vehicles, city buses, and trucks. School buses in Dubai are tracked and drivers and operators are notified if buses veer from their planned routes. Parents can track their child’s progress to and from school and are notified a few minutes before it is time to pick up and drop off their children. GIS is also used to overlay the path of storms with sensor data to narrow down which electric utility equipment could be impacted by severe weather, reducing outage time and accelerating restoration of service. The increasing reliance on spatiotemporal data means that GIS will become essential as communities begin to adopt more advanced technologies. Community engagement means that you can communicate directly with citizens and staff, and they can communicate immediately with you — reporting problems, locating services, and supporting local initiatives. Citizens can use their cell phones to voluntarily collect information about their surroundings and share that data with the community. You can use GIS to aggregate this and other data on a map to identify hot spots such as water conservation concerns, property damage, mobile health clinics, or areas in need of graffiti removal. Sensor data and community engagement within GIS give a clearer view of your community. You can make that view even more holistic by adding 3D visualization and analysis. Compare, for example, construction proposals of a new structure by viewing and analyzing them from every angle to see how each proposal fits into the landscape. You can make a more informed decision before any construction occurs. Urban planners and the public can see the potential impact of any proposed building in terms of issues such as where it will cast shadows, block views, or reflect heat. And it’s not just decisions about buildings that will benefit from a 3D view. When you see 3D representations of mass transit proposals, you get a more realistic view of the impact on communities and existing structures, so you can more accurately discuss the merits and concerns of proposed routes. The immersive nature of 3D visualization makes it an unparalleled tool for communicating community impact of a project design. As populations grow and become more urban, leaders are under more pressure to design healthy, desirable communities with consideration for the way a built environment impacts residents’ health, the economy, nature, and quality of life. 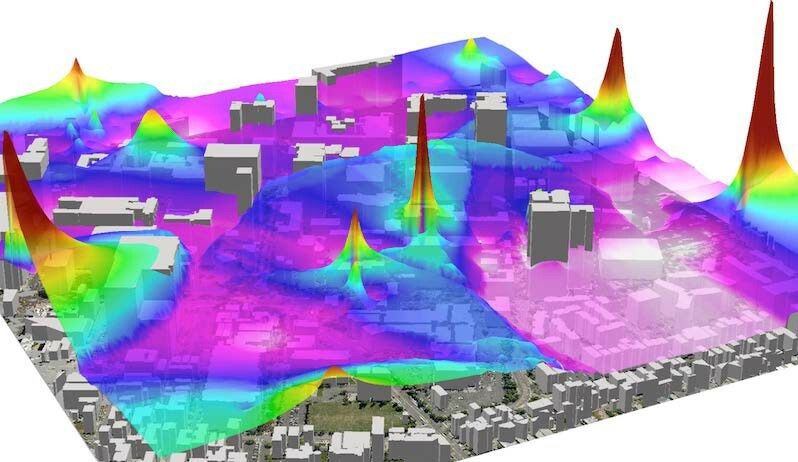 GIS enables 3D modeling of large cityscapes, so planners can change a design and immediately see how it would affect livability, sustainability, and economic development for the entire community. In this way, the overall impacts of different development proposals can be calculated quickly and presented to stakeholders, helping them make better decisions. 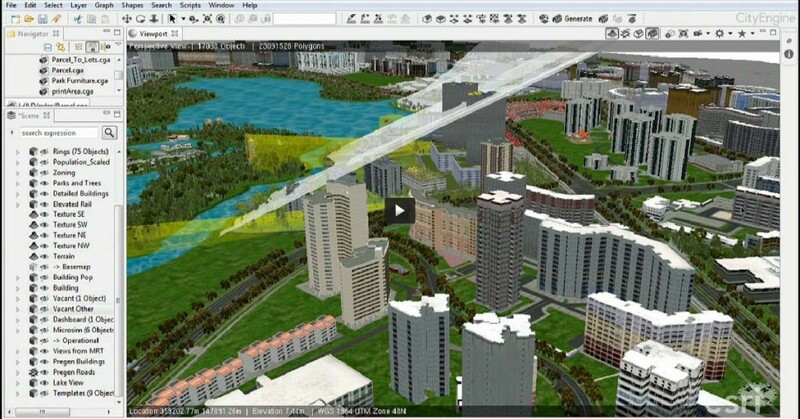 Case Study: Singapore uses 3D modeling to carefully plan growth on the already densely populated island. Singapore’s Urban Redevelopment Agency takes into account local planning guidelines for land parcels and applies local building templates to iterate feasible designs quickly. Lines of sight and changes to traffic patterns are easily assessed and viewed in the context of a 3D environment. 3D visualization is an excellent tool for quickly understanding patterns in sensor data collected across the city and at different elevations. For example, you can collect noise pollution data at different locations and building elevations throughout the city and render that data in 3D. Likewise, you can look at the severity of air pollution measured by sensors in 3D to show areas where pollution needs to be mitigated. 3D visualization is not limited to viewing the exteriors of buildings — data within buildings can also be visualized for analysis. GIS within buildings can be used for maximizing the efficient use of space, keeping track of the location of costly equipment, mapping floor plans and escape routes to help emergency services workers, and determining the best routes within buildings for getting somewhere. Data captured from sensors within buildings can be used to map the flow of people, measure indoor climate conditions, and help determine when and where maintenance is needed. Case Study: Esri partner, Valarm, used a GIS-based app to collect air quality data such as volatile organic compounds (VOC) around the University of Southern California (USC) campus in downtown Los Angeles, California. The sensor data was combined with GIS for 3D visualization. Given the global concerns of climate change and growing population, it is more important than ever to evaluate planning and design decisions related to the built environment within the context of the natural environment. Communities need access to geology, biology, ecology, hydrology, meteorology, and other scientific data during the design process. Geodesign is a formalized process for taking into account all the geographic information and stakeholder input available when deciding where and how to build. Geodesign principles are gaining wider adoption because GIS technology (including 3D visualization) makes them achievable. Geodesign uses GIS to automate the calculations of hazards, risk, sensitivity, capacity, proximity, accessibility, vulnerability, and other factors to inform design decisions. This allows planners and the community to compare and evaluate different plans more quickly. By incorporating geodesign principles into the planning process, communities have another means of increasing the sustainability and livability of an area while decreasing the overall time used for design projects.